Back Row, left to right: Mark Mollan (Maritime/Navy reference Archivist), David Ferriero (Archivist of the United States), Jane Lubchenco (under secretary of commerce for oceans and atmosphere, and administrator of NOAA), Kathy Wendolkowsky (oldWeather citizen scientist), Linda Joy (NOAA Communications), and Kevin Wood (oldWeather-Arctic principal investigator). 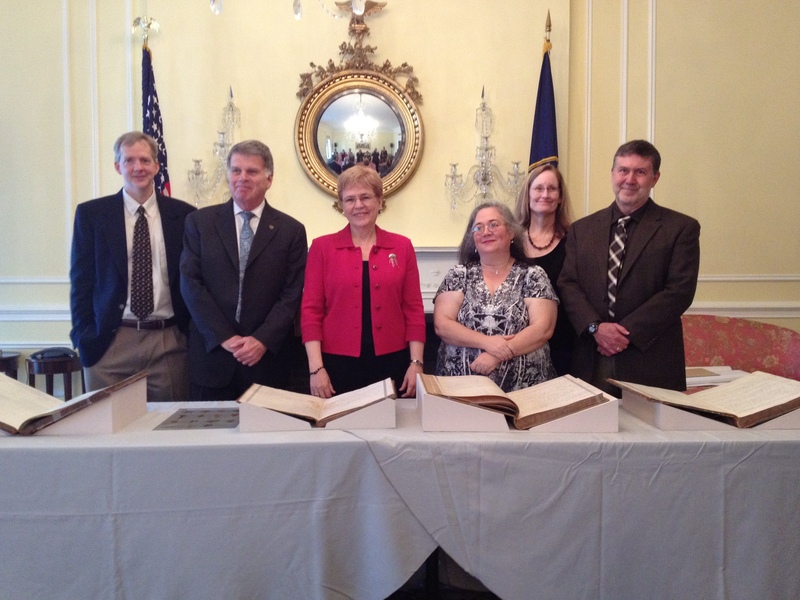 Front row: logbooks of USS Jeannette, USRC Bear, USRC Corwin, and USS Vicksburg. It’s not enough just to launch an exciting new project. We also have to tell everybody it’s started so they know that they can join in. So as part of the oldWeather-Arctic launch we held a press event, hosted by our friends at the National Archives in Washington and splendidly organised by Linda Joy, from NOAA communications. Most of the project participants live too far from Washington to attend (I phoned in, to help answer questions, but it’s not the same). However we were ably represented by Kathy Wendolkowsky and Kevin Wood, who explained to a fascinated audience of dignitaries and members of the press, what we are doing, why it’s important, and why it’s fun. Photo credit: Amy Cox (NOAA) – it’s a little blurry because she could not use the flash (it’s bad for the logbooks).